The electronic keyboard is a relatively ‘easy’ instrument for your child to get started on, especially compared to instruments like the violin, and has plenty of features and functions to keep your child inspired and captivated. Sometimes known as the ‘portable keyboard’ it’s system was based on the ‘home’ electronic organs of the 1960’s and 1970’s. These had rhythm units and a left hand accompaniment system. Your left hand plays chords, while your right hand plays the melody. The accompaniment section follows the left hand chord progression and adds other band instruments like bass, guitar, brass, strings and drums etc. This style of playing is slightly easier than piano, whereby the left hand usually plays more complex ‘bass clef’ parts. Young beginners may start out playing with what is known as left hand ‘single finger’ chords, whereby one note is pressed in the left hand and the keyboard automatically adds the extra notes required to sound the full chord. As the child develops they will soon progress onto ‘fingered’ left hand chords which requires three or more fingers to be played at the same time to produce each specific chord. Having lots of different instrument sounds to choose from and drum beats to play along with certainly helps to keep your child interested in their studies. Many keyboard models now allow the user to record their performances (a handy practicing tool). 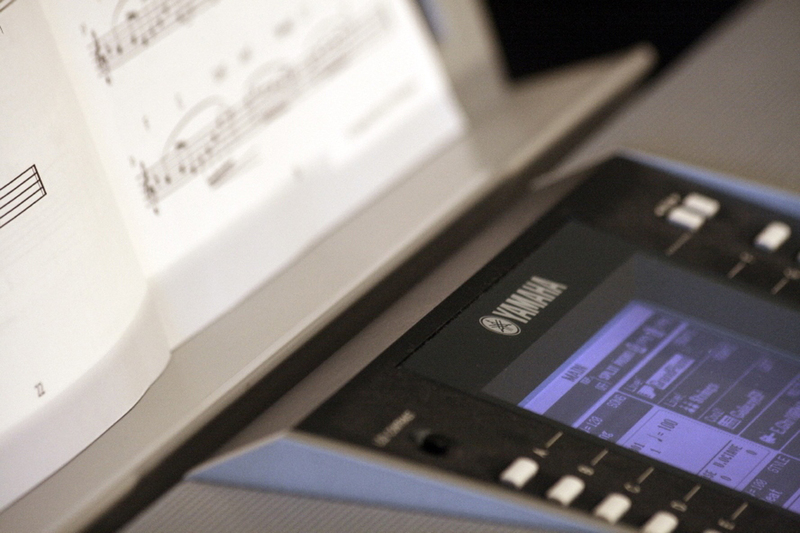 You can also connect with a computer so that songs can be downloaded onto the keyboard to play along with and you can save your own recordings onto the computer. In fact, these instruments are continually developing and ‘keeping adrift’ of the modern technological advances of the day, not only in terms of sound quality but also with regards to ‘connectivity’. If your child decides to start keyboard lessons with Musicworks’ they will be required to have their own keyboard. In most instances they will need to bring their instrument along to the lesson each week and to take it home between lessons to practice on. Please vist ‘choosing the right keyboard’ for help and advice on the type of instrument that will be suitable for keyboard lessons with Musicworks. Various options are available for keyboard lessons, including small group tuition (of no more than four pupils per group) and one-to-one tuition, with the maximum lesson length being 30 minutes. To see all our keyboard lesson options and prices please visit ‘keyboard & guitar prices’. Most Musicworks’ keyboard pupils have the opportunity to work through the LCM graded exam system. This syllabus covers many different styles and genres of music, exploiting the versatility of this instrument, and encourages interesting and creative performances from the student. You can watch demonstrations of some of these LCM keyboard exam pieces at our Musicworks ‘YouTube’ channel. ‘Progressive Keyboard Book 1 for Young Beginners’ by Andrew Scott and Gary Turner. ‘The Complete Keyboard Player Book 1’ by Kenneth Baker. ‘LCM Step This Way, (Steps 1 & 2)’ by Barbara Bray and Janet Dowsett.